For the hospitality industry TOPAZ Digital are in a unique position to be able to offer an extensive range of technological solutions to both broadcast your message in a dynamic and eye catching way, increase recall of message and influence guest behaviour, plus the ability to interact directly with your target market all whilst controlling your messaging from a local, regional or international level putting you & your marketing team in total control. 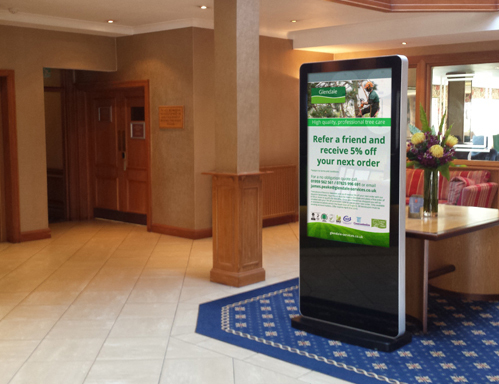 For any hospitality environment the use of digital can almost be limitless. Below are a few examples of some of the targeted solutions we can offer you and how these can best be applied – however this represents just a small proportion of what we can offer your business and we would be happy to discuss specific requests directly. 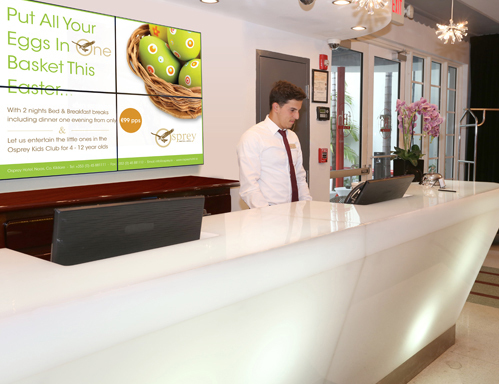 Your Lobby is arguably the most important location for both the guest & for your communication, first impressions count and strategically positioned digital signage provides a very professional feel and engages your customers when you need it most. We offer four main solutions for your lobby all of which ensure you are delivering high impact, engaging messaging at this critical location. When first impressions matter there is no better solution than our Freestanding Screens, simply requiring power these powerful displays enable you to broadcast dynamic and engaging messaging all in an eye catching and striking form that instantly captures a guests attention. With the ability to display information & promotional messaging you can ensure a guest is receiving the latest information relevant to their stay, plus with the ability to show news, weather or sport you can keep them entertained as well! Customers regularly comment on the striking design and it is this coupled with the power of our technology that make these screens such a key part of your lobby signage. For any venue looking to create a focal point in their lobby a video wall enables you to make a BIG statement! Ideal behind a reception desk or on another large space to dramatically uplift the feel of the venue to one that is contemporary & technologically savvy. Surprisingly costing less than you would think the advantage is that these video walls are built to your configuration and you can choose the optimum number of screens for the space available. Show high impact visually immersive graphics to really wow your guests. A ‘must have’ for all forward thinking venues a virtual concierge does not replace the personal touch of your current concierge offerings but instead enhances them! Providing guests with information at their fingertips such as restaurant information & reservations, local amenities, weather forecast and excursions….the possibilities are endless! 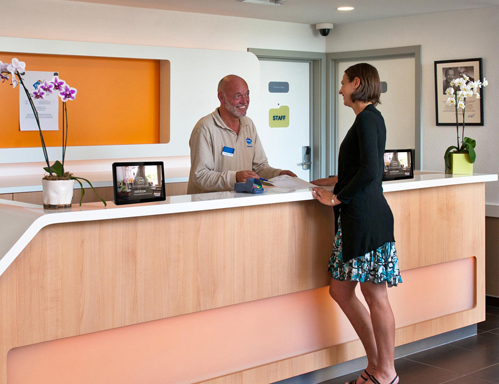 What’s more this virtual concierge is created as a dedicated solution for your venue, so you are in total control as to the services being offered to guests. 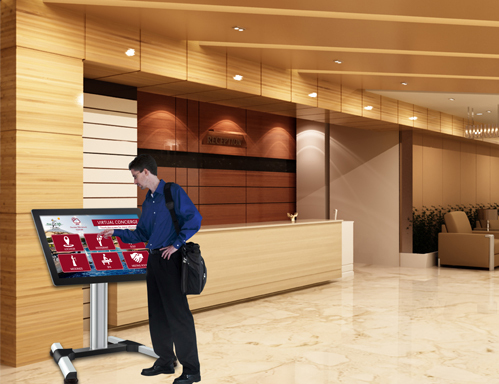 Used in conjunction with any of our Interactive Screens this custom software solution enables you to build lasting impressions for your guests whilst ensuring there is always concierge services available 24/7. 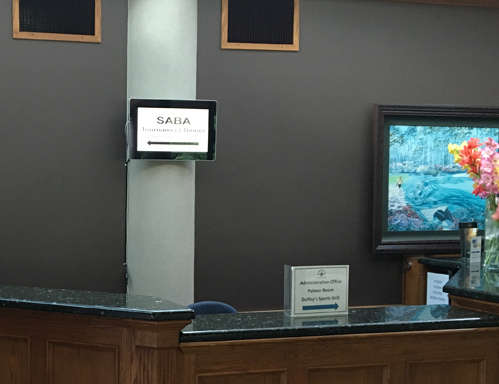 The ability to communicate to guests in a dynamic way extends beyond the main lobby screens, when space is tight such as on a reception desk your communication still matters! Small yet informative, our 10” counter top solution is again Wi-Fi enabled so content can be easily sent out from the back office. Ideal to highlight upsell opportunities such as room upgrades, they are small and subtle but through their dynamic graphics extremely powerful communication tools. 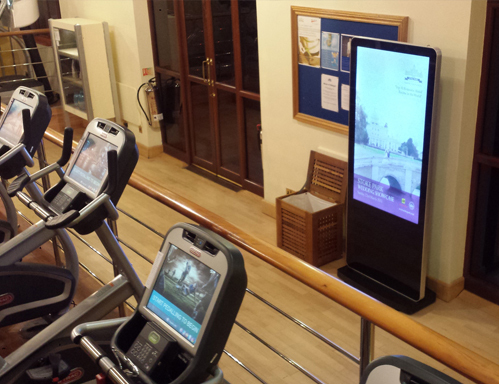 Areas of static footfall such as gyms and spas are a great place to implement digital signage. Using screens to inform, entertain & educate guests will act as your silent salesman – ensuring your messages get seen whilst also providing important information such as opening times and class schedules. Sleek & Stylish, our Wall Mounted and Freestanding displays compliment these areas perfectly whilst our Touch alternatives allow for user interaction. Bars & restaurants are now one of the first areas that venues look at when implementing digital displays due to the flexibility in deployment usage. 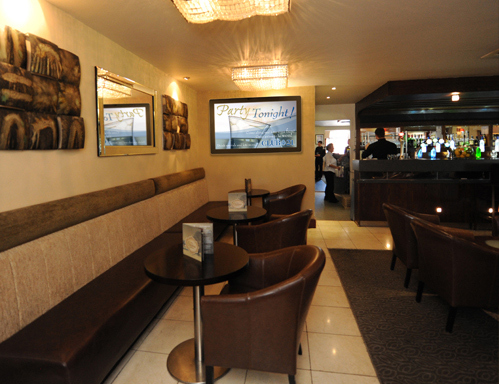 Whether the venue wants a digital menu board, counter advertising, a high impact statement such as a video wall, or a range of other screens, our stylish products ensure that these are not just another ‘screen on a wall’ but a piece of furniture that adds to the overall flow of an environment. Using the standard print out or poster to show the name of a conference room and who is using it is an extremely cumbersome way of informing guests. By using a Small Format display such as a TOPAZ 10”, 19” or 22” SL allows you to update all the usual information and any additional information required all at the touch of a button. Companies using hotel conference rooms love to see their corporate logo alongside a personal welcome to delegates and, as this is all displayed on a stylish display, always gets noticed.